Windows detected hard disk problem error This is the most common issue irrespective of whether you are running Windows 7, Windows 8, Window 10, or Windows XP. Contact the System Manufacturer to decide on whether the disk needs to be Repaired or Replaced Of course, this error seems frustrating as it keeps popping up every 5 or 10 minutes yet it is important to understand the nature of the error, whether it is related to the system, file, or hard drive, its reasons and solutions. What Does ‘Windows has Detected Hard Disk Problem’ Mean? A hard drive is failing. A hard drive will die either sooner or later. All the data that the hard drive includes is at stake. It will be lost once the disk dies. 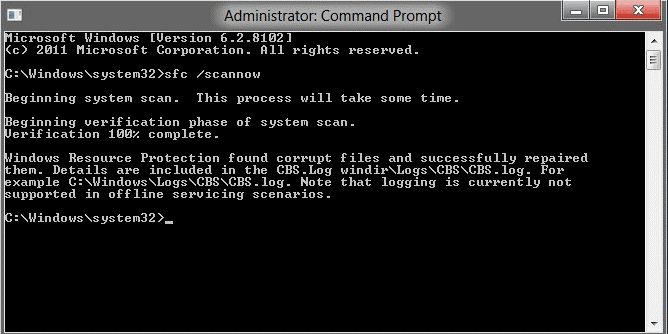 Windows system file may become corrupt. The Operating System may not be booting. The PC is consuming a long loading time and fails to respond. 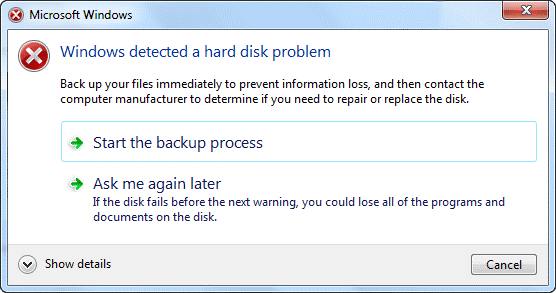 What are the Reasons for Windows Detected Hard Disk Problem? There are several mechanical and logical errors on the hard drive that which leads to bad sectors or a corrupt file system. When these issues arise, the system generates a hard disk problem error to prevent data loss. Virus attack is a common occurrence. Irrespective of whether you have powerful antivirus software or not on your system, it may still be vulnerable. Though the presence of an anti-virus software makes it different yet this does not indicate that the system is virus-proof. So, once the system is infected by a virus, some damage will happen, which in most cases even the anti-virus software may not be able to repair. Sometimes the System File Error such as important system files deletion, excessive startup entries, improper PC shut down, fragmented files, registry error, to name a few can be the cause. Consequently, The reason being, all these actions lead to corrupt system files entries. Above all, it further results in improper working due to missing link or incorrect data. Though neglected yet it is also a major cause as sometimes, users by accident carry out several improper actions. These actions have the potential to impact the system performance such as system file properties changes, system registry setting modification, improper plugins installation, etc. 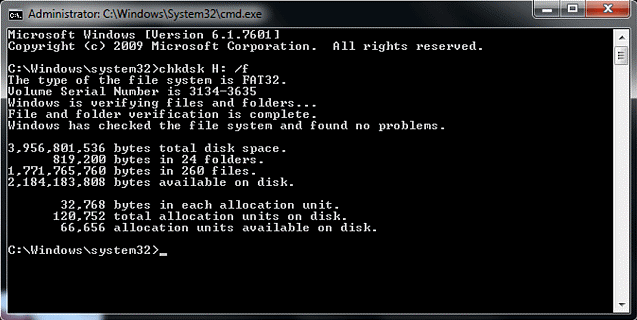 How to Fix Windows Detected Hard Disk Problem? Windows offer several basic tools to handle such errors. With these simple tools, you can easily fix the error as they are easy to use. This is a fast process, by which you can replace the corrupt files with a backup copy. Note: Make sure to close the window only after complete verification. Note: Make sure to back up the data before executing the command. When the issue is not with the Partition File system or the System, verification of the hard drive health is another trick. The reason being, it might have bad sectors. In such scenarios, when the cause of the error is bad sectors, going for the windows data recovery software seems to be a practical option. As a last resort, when none of the afore-stated solutions seems feasible, trusting on a Professional data recovery service provider is an ideal solution. The reason being, by joining hands with them, you can easily handle all types of cases with great ease and convenience. Furthermore, one such professional data recovery service provider is Stellar Data Recovery. We are handling the wide clientele across 15 locations in India since the last two decades. Thanks to our strong and dedicated R & D team, experienced Data Recovery Experts, and State-of-the-Art Class 100 Clean Room Labs, we have garnered around 3 million+ satisfied customers. Hard Drive is the core component of the Computer. We all use it to store our valuable data. Thus, when it fails, data is at stake. In this situation, the question that arises is how to fix the hard disk problem on windows. Depending on your needs and requirements, in other words, you can choose the approach you consider as the best fit and minimize data loss. How to Fix USB Device not Recognized Error in Windows? I was searching for How to fix – Windows detected a hard disk problem and thankfully reached this blog, I like reading this blog, thank you. We are happy that you find our blog useful and being here to know more. I have seen many time this error but never think about it. today read this post, completely understand it means. We are pleased that you liked our blog….. stay connected with us for more updates !! Hi, am Niel Graham my system was displaying disk error. My Main drive on which windows is loaded has been divided into three drives. But, it was taking time and windows executed a message saying: “Windows Delay Error”. I have encountered this hard disk problem many times and had to call the technician for resolving it. After going through this article, I am now capable of fixing this problem without someone’s help. Thanks for helping the windows users.